He will cover you with his feathers, and under his wings you will find refuge; his faithfulness will be your shield and rampart. You will not fear the terror of night, nor the arrow that flies by day, nor the pestilence that stalks in the darkness, nor the plague that destroys at midday. And I am convinced that nothing can ever separate us from God’s love. Neither death nor life, neither angels nor demons,[a] neither our fears for today nor our worries about tomorrow—not even the powers of hell can separate us from God’s love. Struggling with fear, anxiety, and crushing worry? “What happens in our Christian walk will always be with God. Even when we stand on the precipice of the unknown, feeling the knots in our stomach, fretting at night rather than sleeping, wondering what will happen next, we can hand that situation over to God and remember that He is with us. Jesus said it to the disciples when they called out in fear on the lake, ‘Don’t be afraid,’ he said. ‘Take courage. I am here!’ (Matthew 14:27 NLT). Take courage, because He’s here, right here with you, present with you, never abandoning you, not sending you out all by your lonesome self. He knows the risks. He knows what makes your heart quake. He knows exactly what’s going to happen when you obey His call, and He promises to be with you no matter what.” (Anywhere Faith). I trekked across the parking lot at Epcot in the mid-day August heat with my two-year-old in tow. Why were we attempting this feat? Because my son uses Caprisun juice pouches like most kids use pacifiers or a security blanket. When he is tired, overwhelmed, scared, or maybe even bored, he asks for a juice. Normally, this is no crisis. But that day was the final stretch of a six-day marathon at DIsney. He was a bit overwhelmed. He was a teeny bit bored because, while Epcot was awesome, he was too small to ride some of the attractions. That meant he was cruising through our Caprisun supply faster than I anticipated and I was running out. No fear, though! I had more in the minivan. Hence, my mid-day jaunt out to the parking lot. We finally arrived, a hot, sweaty mess. I unlocked the van, plopped him on a seat and enjoyed a few seconds of air-conditioning while I pulled Caprisuns out of the cooler. He promptly hopped into the front seat and pretended to drive. Then, we walked back to the park and had a grand old time with our refilled Caprisun supply and a happy two-year-old. But that’s when I began to fret. Normally, any time my son climbs into the front seat of the minivan, he immediately turns on the lights. He has an auto-reflex with buttons. My fretting began as a fairly reasonable question and quickly escalated to worries beyond proportion. I had to get control. After all, I’ve never been to Disney before. This was my big chance to enjoy the day with my family. I could spend it relishing the moment. Or I could spend it fretting over a hypothetical future. I considered the worst case scenario: He turned on the lights and I didn’t turn them off. The van battery is drained. We ask the Disney car-rescue people to jumpstart our van. So, could I let it go? At the end of the day, we found the minivan with its lights off. No crisis at all. Had I spent the day worrying, I’d have wasted every joy-filled moment on a hypothetical that never happened. The truth is, we have plenty of opportunities to fret in life and most of them are for naught. We often worry over a future we’ll never face and circumstances we won’t even endure. I certainly had a week full of chances to choose to fret or choose to trust. Our cat became extremely ill just as we left for Disney. An odd warning light flicked on in our minivan just as we pulled into the first Disney parking lot. My husband’s car sat at a repair shop back home waiting for the mechanic’s verdict about brakes. Fret, fret, fret. I could have done it all week long. But God cared for us: Cars without the problems we expected, a cat who was better cared for than we could have even cared for him ourselves. All those opportunities to worry became opportunities to trust Him and find the blessing of His grace and abundance. David was tempted to fret also, in his case over evildoers who seemed to get ahead. But, like me, he had to discipline his vision. Where was he looking? At circumstances? Hypothetical tragedies? At others? No, he recaptured an eternal perspective. What truly matters in the light of heaven? (verse 2). 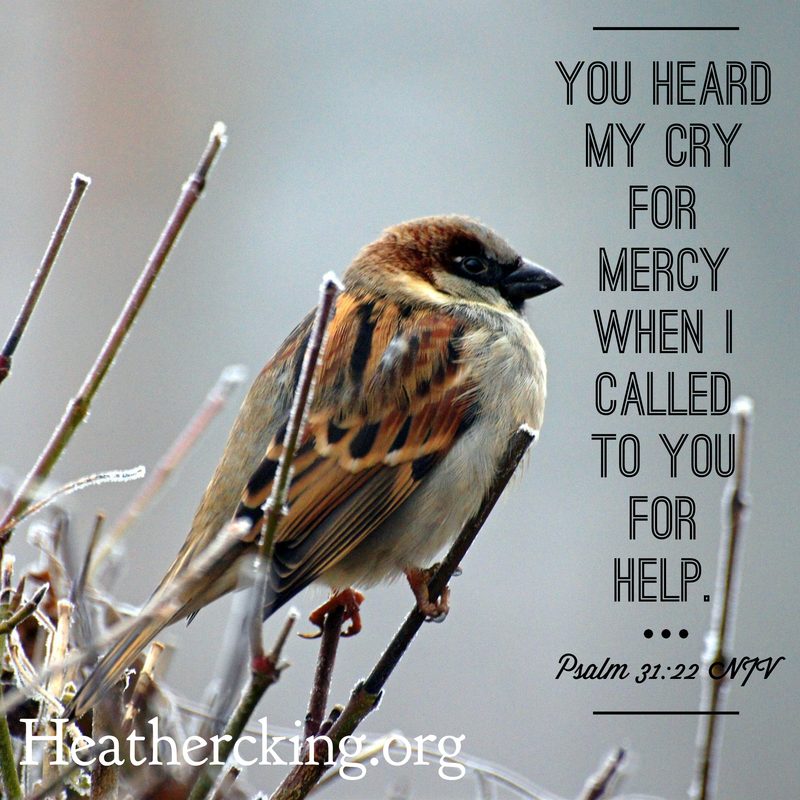 He focused on God: trusting Him, delighting in Him, and committing his ways to the Lord. And then he chose to “do good.” He didn’t remain paralyzed by the fear and the fretting; he took one right and true step forward at a time and kept on moving closer to God. Recapture a vision of heaven. Take the next good step and trust Him with everything else. I remember thinking that I would have done the same thing. At the National Holocaust Museum in Washington, DC, I picked up a tiny booklet with a name and a story inside. My booklet told the story of a survivor. My friend’s, however, did not. Hers was a mom with a young daughter. When the death train stopped outside the concentration camp, guards tried to push the crowd into two separate lines: Those who could work and those who could not. But the kids were considered a burden without benefit, so they were immediately sent to the gas chambers. This woman, though, refused to be separated from her daughter. She must have clung insistently, desperately, stubbornly to that little hand. I imagine her words, “Don’t be afraid. Mommy’s with you,” even as they walked into death together. I hope I would have done the same thing. I’d want to be there with my kids for every frightening, fearful, terrifying thing they might face. I’ve watched in the school parking lot on those scary days when a school shooting hits the news. Moms pull the minivans right over, climb out and take a moment to squeeze their children. We all fear. I do it, too. After the news headlines, I want so much to retreat with my kids to a secluded cabin in the woods, my pitiful attempt to protect them from the madness of sin in this world. Yet, that’s the truth of it all: we live on a sin-scarred planet and while there are hints of beauty here, and there is mercy and grace, there is also pain and sorrow. How can we wake day after day, not in defeat, resignation or anxiety, but with the joy of the Lord and the peace of salvation? The gospel message is all about hope for the hopeless, light in the darkness, joy in sorrow and peace in turmoil. It’s for those hopeless enough to feel like one more day alive is too much to bear. It’s for those of us watching the clock at night, too worried about bills and our kids, our marriages, conflicts with family, or problems at work to sleep in peace. It’s even for a worrier like me, anxious over the little things like birthday parties and church program. It’s for the daily troubles that we turn into crises and for the life-and-death struggles we sometimes face. It’s the reminder that God came here to be with us so we wouldn’t be alone, and He will not leave our side. That’s the hope we have. Not us alone in a crazy, mixed-up, broken world. Not us alone facing bills and divorce, depression or stress. Not us alone against any road-bumps ahead in the new year. That wasn’t just God’s plan for our past. It’s been His passion from the beginning of Creation—to be with us. It was His driving desire all those years of patiently planning for our salvation through Christ’s coming, His death, His resurrection. “Look! God’s dwelling place is now among the people, and he will dwell with them. They will be his people, and God himself will be with them and be their God. ‘He will wipe every tear from their eyes. There will be no more death’ or mourning or crying or pain, for the old order of things has passed away” (Revelation 21:3-4). We close another Christmas season. We stop playing the carols. We pack up the decorations. We make resolutions and plans for the new year. He chose to be with us so we could choose to be with Him. So we do not need to be afraid of facing anything in this life alone. After having three girls, when I found out I was having a son, other moms chimed in with tons of wisdom. They told me to prepare for climbing, running, growling, and dirt (lots of it). They told me no one would love me like a son, not ever. “It’s different than with a girl,” they said. Mom after mom told me that no one treasured her as unconditionally or completely as her son had when he was little. Then older moms started warning me. They are still offering forebodings of doom. I’ve had several depressing conversations just this week about my future. I get it. “Leave and cleave.” I don’t want my son to be a stunted mama’s boy. I don’t want to break up his marriage by pitting myself against his wife or refusing to let go. But I wouldn’t mind if he chooses a wife I could get along with or calls me once in a while. I wouldn’t mind a visit here and there and I’d hate it if he only hung out with ‘her’ family instead of sitting around our holiday table sometimes, too. I’ve been enjoying this season with my son, loving and loving it. I love train shirts and train toys and train books and conversations about trains. I love airplanes and bulldozers and how we have to point out the fire trucks every time we walk past the fire station on Main Street. I love making faces at him in the mirror and growling out funny voices. I love toting along a few trucks everywhere we go. This is my great joy. But this week, other women have been telling me to enjoy it now because I might as well kiss my son goodbye in a few years. So I’ve been more than a little sentimental and emotional. It’s my nature and my way to pray about my kids’ future, their choices, their passions, their careers, their spouses, and my son is no different. A week of prophetic doom, though, has my heart more fearful than hopeful or prayerful. I don’t know what may have your heart turning somersaults of fear instead of clinging to hope this week, but my kids’ future has done it for me. It’s made me clingy and tearful. Yet, this verse offers me security and peace. This isn’t the season for me of farewells or parenting adult children and worrying over their not-so-adult decisions at times. This is my season of early morning snuggles on the sofa before everyone else awakes and making pancakes in the shape of Mickey Mouse. It’s my season of listening to all of their news about their day at school, laughing at funny lunch escapades and wiping away tears when another girl gets mean. It’s my season of bedtime hugs and bedtime stories. And it’s my season of lifting children up….up into my arms, snuggled into my chest….up onto my shoulders, high so they can see, high so they can be carried and so they can rest. That’s what God does for His beloved. Don’t strive. Don’t fight. Don’t wear yourself out trying to keep moving forward on your own. High up there on the shoulders of our God, our perspective shifts. Stop fretting about the future. Life doesn’t depend on us to fix it and make it happen; our future depends only on Him and He is so dependable. We are safe from danger. We see the big picture. All that trouble we were in below looks so small from our new spot on the shoulders of the Lord. 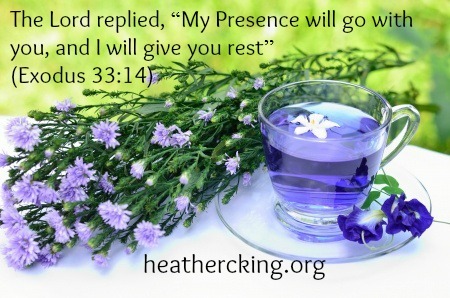 So I choose to rest here with the Lord, enjoying safety, enjoying this season, enjoying His presence, enjoying being His beloved–handing over fear and holding on to hope. I found her with untied tap shoes on her feet and eyes red from crying. We zipped into the ballet studio, one mom and three girls (plus one baby boy) on a mission. Three daughters in four back-to-back and sometimes overlapping dance classes during observation week. This means instead of huddling in my minivan or zooming around town doing errands in between classes, I sat in the corner of class taking pictures. We all piled into my youngest daughter’s class except for my tap-dancing girl who left to change into her tap-tap-tappy shoes. I watched the clock carefully and slipped out just in time to check on her before her tap class began. You didn’t trust me to come help you. I knew you’d need help and I came just in time. She’d been frantic and upset and all along I had a plan for her rescue and I was right on time, not a second too late. So, all her fretting had been unnecessary drama. And when is fretting not? I started this year with intentionality: 12 months of pursuing the presence of Christ in the middle of the noise, mess, and busyness of life. Today, I finish January’s journey, learning to be still and know that He is God. For months, I dreaded this start to the year, knowing it would be the busiest and craziest of our busy and crazy schedule. I feared the stress—-as in, tearful eyes, breathless suffocation just thinking about it. But here we are. We made it. God is gracious. When I felt that familiar strangulation of fear, I heard that still and small reminder: Don’t worry about that. Just think about today. And, as much as I whine perhaps about winter, the overload of snow days has given me unexpected rest when we needed it most. God planned the perfect rescue at the perfect moment for me all along, but I had been fretting and worrying. Because I didn’t trust Him. 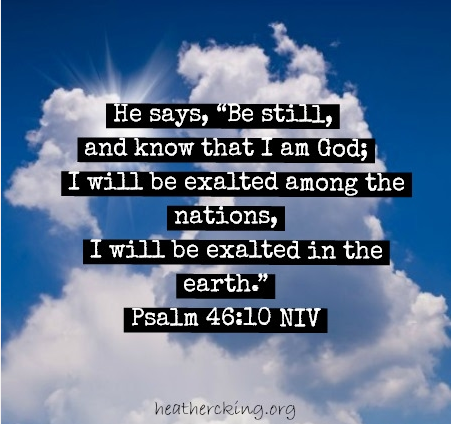 So often, we read that familiar Psalm—-BE STILL and know—and we focus on the stillness (Psalm 46:10). Yes, stop with the flustered activity, the desperate attempts to fix things on our own, the frantic search for help from everyone except the only One who can truly save…. “Cease striving” it says in the NASB. So, for a moment we pause. Here’s what I’ve learned this month, though—“Being still” is not enough. It simply tells me what not to do. Know Him, Know He is God, Know that He’s got this under control and I can rest in the knowing that He cares for me. Ann Voskamp reminds me of this….to remember He is I AM. His very name is the reminder of His Presence here in this present moment. Like Moses, I’ve asked in the boldest of ways that God will show me His Glory this year. And, like Moses, I’ve told God that I don’t want to move from this place until His presence will go with me. If you are pleased with me, teach me your ways so I may know you and continue to find favor with you (Exodus 33:13). Because, God, in order to dwell in Your presence day after hectic day, I must be still and know You more, know You as I AM, know You as God present with me. To read more about this 12-month journey of pursuing the presence of Christ, you can follow the links below! Won’t you join me next month as I focus on Praying Simply?